Los Angeles, CA, December 21, 2017– Residents of Ventura and surrounding cities continue to try and rebuild, while the Thomas Fire continues to burn. A Local Assistance Center (LAC) set up at Poinsettia Pavilion (3451 Foothill Road, Ventura, CA 93003) has been the primary site of disaster recovery assistance, where over twenty groups and agencies, including The Salvation Army, are speaking with victims and survivors and assessing their needs. The Salvation Army in particular has been a major presence at the LAC. 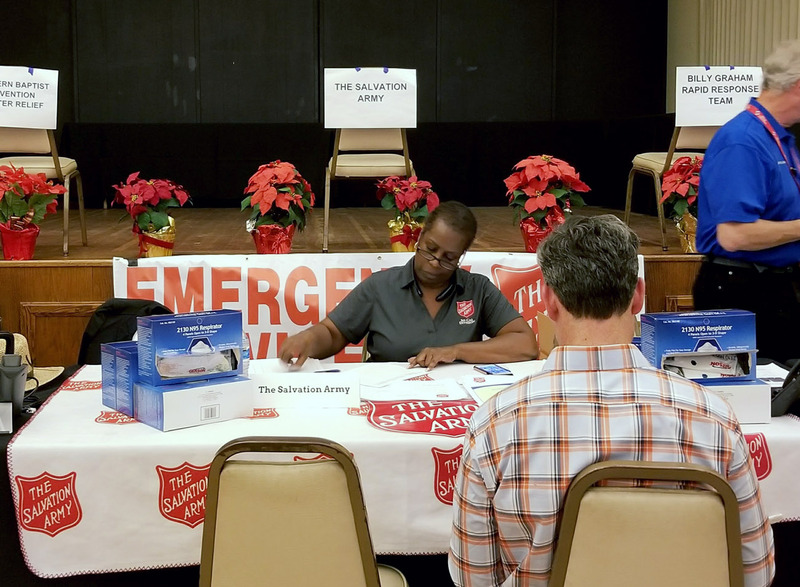 Since last Wednesday, December 13, staffers from The Salvation Army have spoken to and given assistance to over 312 households; this aid has a combined financial value of more than $88,550. The Salvation Army’s Ventura Corps headquarters (650 S Petit Avenue, Ventura, CA 93004) is currently serving as a distribution center where visitors can pick up supplies such as canned goods, cleaning products, and hygiene products. Previously, in the immediate aftermath of the Thomas Fire, The Salvation Army staffed two major evacuation shelters and distributed over 5,000 meals in total. As the need for shelters reduced, The Salvation Army transitioned out of them and began the work of recovery with residents. This included a large distribution center at the Santa Paula Community Center, which gave out approximately 1,595 items of clothing, 274 cases of water and more, before closing on December 17. The Salvation Army Ventura Corps board members, with the support of the Rotary Club, also provided hundreds of meals to National Guard troops. The Salvation Army is asking the public for financial donations, which can be used to meet immediate challenges and specific needs. To donate, go to socal.salvationarmy.org or call 1-800-SAL-ARMY and donate to fire relief today. As shelters have scaled back and some evacuation orders have been lifted, the focus has shifted into recovery. This has taken the form of distribution centers at The Salvation Army Ventura Corps (650 S Petit Ave, Ventura, CA 93004) and the Santa Paula Community Center (530 W Main St, Santa Paula, CA 93060). Both locations are distributing canned goods and non-perishable food items, while the Santa Paula location is also distributing clothing, hygiene products, diapers, cleaning kits, toiletries and more to people affected by the wildfire. In three days (December 11 to December 13) both centers have combined to distribute 99 blankets, 416 items of clothing, food items to 57 families, 144 cases of water and 417 respirator masks. Anyone affected by the wildfire that needs immediate supplies is being instructed to stop by one of the locations. A Local Assistance Center (LAC) has also been set up at Poinsettia Pavilion (3451 Foothill Rd, Ventura, CA 93003). The Pavilion will host several agencies and organizations, including The Salvation Army, to offer information and assistance to survivors. The Salvation Army has been fulfilling the need by providing financial assistance to families and individuals that have lost their homes to the fire. The LAC is tentatively open until December 31 depending on the needs of the community. Los Angeles, CA, December 12, 2017– While other fires in Southern California have seen significant progress in terms of containment, the largest incident, the Thomas Fire, continues to threaten 18,000 structures in the Ventura area. With containment levels at 15%, The Salvation Army continues its relief campaigns for first responders and evacuees alike. Since December 5, The Salvation Army has been providing food service, emotional care, and spiritual care at two major evacuation sites: Nordhoff High School in Ojai and the Ventura County Fairgrounds. Last week, The Salvation Army served a combined total of 4,619 meals at these locations. The Nordhoff Evacuation site closed on December 9 citing health concerns caused by the fire, and evacuees are expected to check into other sites. Shelters remain open at Oxnard College, University of California Santa Barbara, and the Ventura County Fairgrounds. The Salvation Army will be expanding and shifting its fire relief operations by distributing goods at the Santa Paula Community Center (530 W Main Street, Santa Paula, CA 93060) and opening two Local Assistance Centers (LACs) in the region: one at Poinsettia Pavilion (3451 Foothill Road, Ventura, CA 93003) and another location to be determined. These LACs are expected to provide social services and other types of assistance beyond immediate needs like food and water. In addition to these Thomas Fire relief efforts, The Salvation Army served 100 meals, 325 snacks, and 1,550 drinks to first responders of the Skirball Fire. The Skirball Fire is estimated to be 85% contained with 6 structures destroyed and 12 structures damaged. The public has been extraordinarily generous with donations of food, clothing, water and supplies. At this time, The Salvation Army is asking for financial donations, which can be used to meet immediate challenges and specific needs without expending resources on storage, transport, and sorting. To donate, go to socal.salvationarmy.org or al 1-800-SAL-ARMY and donate to fire relief today. Los Angeles, CA, December 7, 2017– The fires across Southern California have burned more than 100,000 acres combined, including hundreds of homes and structures. With Santa Ana winds exacerbating conditions, the wildfires are expected to grow throughout the week. The Thomas Fire alone has only reached 5% containment as of this morning. Hundreds of residents across L.A. county have been displaced and are relying on emergency shelters for basic needs and places to sleep. The Salvation Army has been on the scene for the past few days, distributing supplies and food at two major emergency shelters: the Ventura County Fairgrounds and Nordhoff High School in Ojai. Since Monday, 1,500 meals have been distributed to evacuees at these sites. More than 400 people slept at these locations on the night of the 6th. Additionally, The Salvation Army has sent 400 snacks and water to evacuees and first responders in Sylmar and the Sepulveda Pass. Furthermore, we will be serving dinner meals to 500 first responders working tirelessly at the Skirball fire. The Salvation Army disaster response is anticipating a long term response campaign. The organization is asking the public for financial donations, which can be used to meet immediate challenges and specific needs. To donate, go to socal.salvationarmy.org or call 1 800 SAL ARMY and donate to fire relief today. Los Angeles, CA, December 6, 2017– Wild fires in Ventura and L.A. Counties continue to be aided by strong winds and low humidity and are wreaking havoc on several fronts. The “Thomas Fire” is the largest fire and as of 7:45 pm last night was 0 percent contained. More than 150 structures have been destroyed and the fire has grown to 50,000 acres. The Creek Fire which started yesterday in the Sylmar area has likewise grown and is destroying homes and property in the northern parts of the San Fernando Valley. The Salvation Army has been on the scene from almost the beginning and as the fires have escalated so has The Salvation Army’s response. The Salvation Army is handling the feeding of the two main evacuation centers for the Thomas fire at the Ventura County Fairgrounds and Nordhoff High School in Ojai. Combined, there are currently 700 evacuees at these sites and The Salvation Army has committed its resources to feed and provide other comforts to these fire survivors for as long as necessary. Los Angeles, CA, December 5, 2017– The “Thomas Fire” a fast-moving, wind-fueled wildfire, swept into the city of Ventura early Tuesday, burning 31,000 acres, destroying homes and forcing 27,000 people to evacuate. At least 150 structures — including at least one large apartment complex — have been destroyed so far, and many more are threatened as the fire continues to grow. At one point early this morning, flames were only a quarter-mile away from the Ventura City Hall. Despite The Salvation Army’s own Ventura Corps having to be evacuated, Ventura and Oxnard Salvation Army Corps responded to the growing crisis serving more than 400 evacuees at the Ventura County Fair Grounds which has been set up as a temporary evacuation center. With the weather forecast of high winds lurking in the future, government agencies believe the fire will continue to grow and wreak havoc and The Salvation Army will respond accordingly. The Santa Barbara Corps was activated this morning and will be directed to wherever it is needed. Now, a second evacuation site at Nordhoff High School in Ojai has been established, and a third site will be set up by mid-day today. With another wildfire- the “Creek Fire” - growing in the northern part of the San Fernando Valley, The Salvation Army expects to be called upon for further assistance and stands at the ready to do its part. The Salvation Army asks its supporters to keep the more than 27,000 fire evacuees in their prayers and if they would like to offer monetary assistance, call 1 800 SAL ARMY or click here. About The Salvation Army: The Salvation Army, an evangelical part of the universal Christian church established in 1865, has been supporting those in need in His name without discrimination for 127 years in Southern California. Nationally, more than 30 million Americans receive assistance from The Salvation Army each year through the broadest array of social services that range from providing food for the hungry, relief for disaster victims, assistance for the disabled, outreach to the elderly and ill, clothing and shelter to the homeless and opportunities for underprivileged children. About 82 cents of every dollar raised is used to support those services in 7,000 communities nationwide. For more information, go to salvationarmy-socal.org.